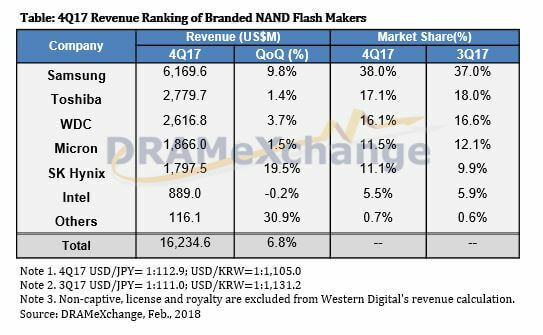 Although NAND flash prices were flat to slightly up in the fourth quarter (Q4) of 2017, suppliers grew their revenues by 6.8 percent on average in Q4, according to DRAMeXchange, a division of TrendForce. The smartphone market was the major demand contributor during the peak season, but the traditional off-season is impacting sales downward in the first quarter, said the market research firm. 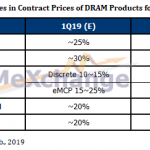 In Q4 only contract prices of embedded MultiMediaCard (eMMC) storage and Universal Flash Storage (UFS) products increased. Pricing was either flat to up by 5 percent quarter over quarter (QoQ), said DRAMeXchange. But products for application areas such as PCs, tablets and servers were either flat or fell by a small margin. 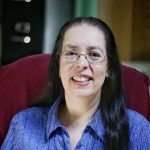 At the same time the market shifted toward a balance in supply and demand. This supply balance is slowing moving into oversupply territory in Q1, resulting in deeper price cuts. 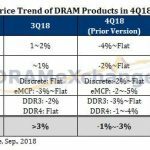 In the first quarter of 2018, DRAMeXchange’s analyst Alan Chen estimates that NAND flash suppliers have cut prices by 3 percent to 10 percent, and these cuts will continue into the second quarter. “As for Q1 2018, the market is currently experiencing a slight oversupply due to the off-season effect,” said Chen. 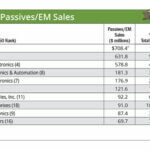 “NAND flash suppliers will see their revenue performances suffer as they cut prices on their products to spur demand. 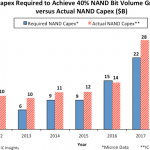 However, they can still maintain a healthy level of profit because their costs of 64- and 72-layer 3D NAND solutions have also shrunk. 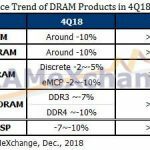 The oversupply in the market forecast by DRAMeXchange in Q4, due to production capacity expansion by suppliers and improved yield rates of 3D-NAND flash, started in Q1 and is expected to continue into the second quarter. The key result: lower pricing. 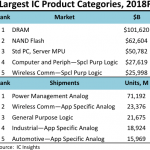 Among the top six NAND flash suppliers – Samsung, SK Hynix, Toshiba, Western Digital, Micron and Intel – market leaders Samsung and SK Hynix both grew their bit shipments in the double-digit range in Q4. Samsung’s Q4 NAND flash bit shipments grew by 10 percent while revenue increased by 9.8 percent QoQ. SK Hynix posted a 16 percent increase in bit shipments in Q4 and a 19.5 percent rise in revenues QoQ. Helping SK Hynix to boost its revenue was a 4 percent rise in ASPs.